Peripheral arterial disease, also called peripheral vascular disease, is a condition in which the arteries (blood vessels) that carry blood to your limbs become narrowed. It mostly affects the blood supply to your legs. The disease often causes pain in your legs when you walk, but some people don’t have any symptoms. Around two in 10 people aged over 60 have peripheral arterial disease. It's more common in men than in women. Peripheral arterial disease usually develops when plaques (fatty deposits) build up on the walls of your arteries. This is called atherosclerosis. The fatty deposits can cause your arteries to narrow and this reduces the supply of blood to your muscles and tissues. This most commonly happens in one or both of your legs. 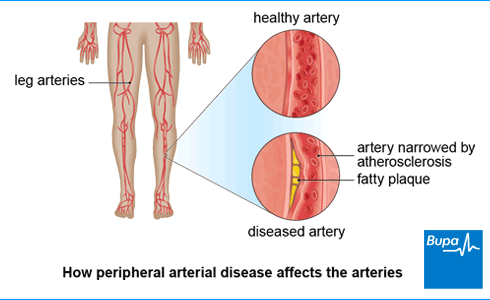 Peripheral arterial disease is a type of cardiovascular disease. Having it puts you at higher risk of heart attack and stroke, both of which can be caused by narrowed blood vessels. See our Complications section further down for more information. Some people who have peripheral arterial disease have no symptoms, so you may not know that you have the condition. Or you may have symptoms but just think they’re part of getting older. If you have symptoms, the most common is pain (like cramp) in your calf when you walk. You might also have pain in your foot, thigh or buttock while walking. This is called intermittent claudication. It’s generally worse in one leg than the other. The pain will usually come on when you’ve been walking, especially uphill, or doing other exercise. Your legs may also ache and feel tired as you walk. It will usually go away quickly – within about five minutes – when you stop exercising. If you have any of these symptoms, see your GP. Your GP will ask about your symptoms, lifestyle and medical history, including any medicines you’re taking and if you’ve got a long-term condition like diabetes. They’ll also ask about your family’s medical history; for example, if there are any heart problems. Your doctor will try to rule out other causes of pain in your legs, such as conditions like sciatica that involve trapped nerves. He or she will examine you, particularly your legs and feet. They will also check your blood pressure and measure the pulse in your groin, knee and foot. This will show if the blood is not flowing as well in part of your body. Comparing the difference between blood pressure in your arm and in your ankle can help with diagnosis. Your GP may refer you to see a vascular surgeon, who specialises in diseases of the blood vessels outside the heart, to confirm your diagnosis. They may advise you to have an imaging test to find out where and by how much your arteries are narrowed. The types of imaging test are explained below. A special type of ultrasound scan called Doppler ultrasonography or duplex ultrasound. This uses sound waves to produce an image of the inside of your body, including your arteries and how blood flows through them. Angiography. This is a test that uses an injection of a special dye into your blood vessels to make them clearly visible on X-ray images. This may be combined with a CT scan or an MRI scan. A CT scan uses X-rays to make a three-dimensional image of the body or part of your body. An MRI scan uses magnets and radio waves to produce images of the inside of your body. Lifestyle changes and treatments aim to stop peripheral arterial disease from getting worse. They can also help to reduce your symptoms. Your GP may also recommend treatments to reduce your chance of developing cardiovascular disease in other areas of your body. Healthy changes to your lifestyle can help treat peripheral arterial disease, whatever your symptoms. They will also reduce your chance of getting cardiovascular disease in other areas of your body. Your GP will explain the changes you can make and help you achieve them. Changes you can make to your lifestyle are listed below. Increase the amount of physical activity you do. If you have diabetes – either type 1 or type 2 – make sure that your blood glucose levels are well controlled by being careful with what you eat. You should also get urgent help for any foot ulcers. If you’re overweight, try to get down to a healthy weight. Try to build up your exercise gradually until you’re doing activities such as walking for 30 minutes at least five times a week. If it becomes painful, take a short break until the pain stops. You should stop exercising if you feel very breathless, dizzy or unwell, or you have chest pains. There may be supervised exercise classes available for people with peripheral arterial disease. Ask your GP if these classes are available in your local area. These may be held at hospital or in a community or leisure centre. They’ll usually involve two or three sessions of 30 to 45 minutes a week over a three-month period. To help manage your condition, it’s important to treat any other health problems that may make it worse. So, if you have high cholesterol, high blood pressure or diabetes, your GP will recommend medications to control these. For example, they may advise you to take medicines called statins and/or an anti-platelet medicine such as aspirin or clopidogrel to reduce your risk of having a heart attack or stroke. If you’re getting a lot of pain, your GP may recommend paracetamol and either weak or strong opioids to help control this. If you take strong opioids, you may feel sick or constipated. There are medicines you can take that can help to relieve these symptoms. Your GP may refer you to a specialist pain management team. There is medication designed to expand narrow arteries, like naftidrofuryl oxalate. But your doctor will probably only prescribe this if lifestyle changes on their own don’t relieve severe symptoms, or surgery isn’t an option. And if it doesn’t help, your doctor will suggest you stop taking it after a few months. Surgery is an option if lifestyle changes (including an exercise programme) aren’t helping you or your symptoms are getting worse and seriously affecting you. Your doctor will also check that you’re fit enough to have surgery. Before surgery, you may have another MRI scan, CT scan or angiography. This helps your surgeon see exactly where your arteries are narrowed. There are two different operations to treat peripheral arterial disease – angioplasty and bypass surgery. Your surgeon will advise you which operation is best for you and talk you through the risks and benefits. You might find it useful to use these questions when talking to your surgeon. The type of operation they recommend will depend on many factors. These include how severe your condition is, if you have any other health conditions and your personal preferences. In an angioplasty, a radiologist or surgeon will insert a catheter (fine tube) with a small balloon on the end into your narrowed artery. They will inflate the balloon and then remove it. This will stretch your artery and squash the fatty tissue inside to allow more blood to flow through the artery. Your radiologist or surgeon may put a stent in the artery. This is a small wire-mesh tube that will hold your artery open, and is left in place. You may need to stay in hospital overnight after an angioplasty, or be able to leave the same day. In bypass surgery, your surgeon will create a detour around your affected artery to go round the blockage. They will use a healthy blood vessel taken from somewhere else in your body, usually an arm or leg. If it’s not possible to use one of your own blood vessels, an artificial tube will be used instead. This surgery is more risky. You’ll only be offered bypass surgery if your leg pain is severely affecting your day-to-day life. It is usually done under either a spinal or general anaesthesia. You’ll probably need to stay in hospital for at least a week and you’ll be given painkillers. You should take it easy for a while afterwards but do regular gentle exercise. Your doctor will monitor you if you’re being treated for peripheral arterial disease, in case you have any complications or your symptoms come back. If you have peripheral arterial disease, you’re more likely to have some other medical conditions. These are described below. Coronary heart disease. If you have peripheral arterial disease, you may also have a build up of fatty deposits in the walls of other arteries in your body, such as your coronary arteries (which supply blood to your heart). These can become narrowed and blocked and lead to angina or a heart attack. Stroke. If an artery in your neck that supplies blood to your brain is affected, it can become narrowed or blocked and cause a stroke. Around two in 10 people who have leg pain when walking (intermittent claudication) will develop a more serious condition called critical limb ischaemia. This is when your leg isn’t getting enough blood. The main symptom of critical limb ischemia is that your leg becomes painful when you’re resting. This may be at night, when you’ll find the only way to relieve the pain is to hang your leg out of bed. Another symptom is ulcers under your heel or between your toes. The skin on your leg may look mottled when you raise it and dark red when you lower it. If you spot these signs, contact your doctor straight away as you’ll need to have urgent treatment. You might get gangrene if you have critical limb ischaemia. Gangrene happens when your leg doesn’t get enough blood supply. This means a toe or part of your foot can go black as the tissue dies. It can be painful, and it can get infected and make you very unwell. The dead tissue won’t heal, and may need to be removed surgically such as with an amputation of a toe or part of the leg. You may be at more risk if you have diabetes. Critical limb ischaemia can also stop other organs from working properly. Your doctor may recommend amputation if permanent pain or weakness in your leg means you can’t walk at all. If your leg is at risk, your surgeon will discuss the options with you, including the benefits and risks of surgical treatment, conservative management and amputation. They will make a treatment plan with you according to your wishes and your medical condition. Other treatments are also being developed to help blood flow by stimulating your spinal cord or transplanting blood cells from bone marrow. If you have any questions, or would like more information about this, speak to your doctor. Even if you’ve had surgery for peripheral arterial disease, it’s possible your arteries may narrow again. Long-term lifestyle changes can help reduce symptoms and stop the disease coming back after treatment. If you smoke, stop. Smoking is one of biggest risk factors for peripheral arterial disease, especially in people over 50. For more information about how smoking can cause peripheral arterial disease, see our FAQ further down: How does smoking relate to peripheral arterial disease? Take more exercise. Ask your GP what type and level of activity is suitable for you. Walking is great because it improves the blood flow, gets more oxygen into your leg muscles and can encourage new blood vessels to develop around narrow arteries. Eat a healthy, balanced diet. Keep to the recommended limits for alcohol intake and safely lose excess weight. Look after your feet by wearing well-fitting shoes that give good support. Try to avoid going barefoot and letting your feet get very hot or cold. If possible, wash your feet daily and dry them carefully. Take care when cutting your toenails. You may find regular visits to a chiropodist helpful – let them you know you have peripheral arterial disease. It’s important to get your cholesterol and blood pressure checked regularly. If you drive a bus, lorry or coach for a living you must tell the Driver and Vehicle Licensing Authority you’ve been diagnosed with peripheral arterial disease. Otherwise, you could face a fine and be prosecuted if you have an accident. You need to fill in and send form VOCH1. Is peripheral arterial disease hereditary? Is peripheral arterial disease hereditary? If one of your family members has cardiovascular disease such as coronary heart disease or has had a stroke, you may be more likely to develop peripheral arterial disease. But your chance of developing peripheral arterial disease is affected by more than just your family history. Risk factors such as high blood pressure, being obese or developing diabetes aren’t always caused by family history (though sometimes they are), they may be a product of your lifestyle too. That’s why it’s so important to stop smoking if you smoke, take up more exercise, eat well and maintain a healthy weight. These are all things that are within your control and can help reduce symptoms of or prevent peripheral arterial disease. How does smoking relate to peripheral arterial disease? How does smoking relate to peripheral arterial disease? When you smoke and absorb nicotine, your body releases certain chemicals. These chemicals stick to the walls of your arteries and cause them to narrow. Chemicals that your body normally releases to widen your arteries become impaired if you smoke. Carbon monoxide produced by smoking completes with oxygen to bind to the red blood cells that take oxygen to your muscles. The reduction in oxygen going to the tissues means that the pain you feel on walking (intermittent claudication) is worse and happens at shorter distances. Chemicals inhaled when smoking injure the inner lining of arteries, so fatty deposits are more likely to build up and cause problems such as narrowing. Smoking is one of the biggest risk factors for peripheral arterial disease, particularly for people aged 50 and over. People who smoke are more likely to have symptoms with peripheral arterial disease, whereas many people don’t have symptoms. Stopping smoking is the biggest change you can make to your lifestyle to prevent peripheral arterial disease and improve symptoms if you have it. Stroke is the third most common cause of death in the UK and the leading cause of severe disability. Cholesterol is a type of fat (lipid) made by your body and found in some foods.